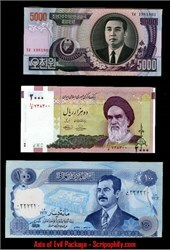 One authentic piece of paper money from the Iran, Iraq and North Korea, featuring Saddam Hussein, Ayatollah Khomeini, and Kim Il Sung. The phrase Axis of Evil was first used by U.S. President George W. Bush in his State of the Union address on January 29, 2002, and often repeated throughout his presidency, to describe governments that his administration accused of sponsoring terrorism and seeking weapons of mass destruction. Iran, Iraq, and North Korea were portrayed by Bush during the State of the Union as building nuclear weapons. The notion of such an axis was used to pinpoint these common enemies of the United States and rally the American populace in support of the War on Terror.